2007 OCB Texas Shredder Classic Bodybuilding, Fitness And Figure Contest Review! Saturday, May 5th, 2007 witnessed the annual Cinco de Mayo celebrations in Austin, Texas this year: but this year it was also the day of the 10th annual Texas Shredder Classic. Bodybuilding.com was among the list of prestigious sponsor’s of this year’s event. Held in the newly renovated auditorium of the Texas School for the Blind! Close to 120 athletes performed to the delight and admiration of a packed house. The Texas Shredder Classic changed sanctioning this year, becoming an OCB event. Rigorous standards including polygraph examination and submission of urine samples by male and female competitors’ alike work to ensure the Shredder Classic’s integrity as the gala drug-free, natural bodybuilding and figure competition event for the State of Texas. Competitors were by no means limited to Texans and included persons from all parts of the USA along with Canada and Brazil. The Shredder Classic reminds one of the Golden Age of Bodybuilding, that era before steroids became rampant, that era in which a sense of camaraderie was shared among athletes, those days in which a genuine sense of community united competitors, fans and friends. It was a night to remember. Master of Ceremonies was the legendary Texas Shredder himself, Dave Goodin, unexcelled champion of drug-free, natural bodybuilding. Amy Dean of Houston, Texas took first place as Ms Fitness, with novice Jennifer Kubista of Boston won an admirable second place. The lean, cut Ms Dean brought gasps of astonishment and amazement from the crowd when it was revealed that her hobbies include baking cookies and her favorite foods are Honey Buns and Molten Lava Cake. Her metabolism must specialize in T3 production! With only a year of training, Sherri Braxton journeyed from Albuquerque, New Mexico to place first in the Short Class of Open figure ... at age 42! With mastery of posing there’s no telling how far this neophyte will go. Rounding out in second place was 39 year old Cindy Lufschanowski with third place going to Jeana Rich. For the Tall Class Shay Stone won first place. Illuminating the crowded hall with the radiance of her irrepressible smile. At 23 Shay was among the youngest of competitors in Open Figure, balanced by seven years of training. Coming in after her were Brenda Mikalajunas, Lisa Putney, Katrina Kannberg, and Kristi Frazier. Women in this category ranged in age from 25 to 41. No one envied the judges for this event. Reserved for those “40 and older”, this class should more aptly be termed “Mature Figures” ... especially since this year’s average contestant has 15 or more years of training experience. These women, like their male counterparts, bear evidence to the anti-aging benefits of training. Spinach loving Sandy Crosslin of Argyle, TX placed first. Her prize winning figure is all the more impressive when taking into account that she’s mom to 3 year old twins Callie and Keenan: she says chasing after them keeps her fit. Rounding out the place winners were Lisa Putney, 41 in second, Peggy Pepitone, 43 for third, fourth to 42 year old Sherri Braxton and fifth to Lulu Olson, 48. Tall and thin Julie Florentin of San Antonia, 32, placed in a decisive first for Military Figure. She’s trained for five years, and her favorite exercises are raising a family of three children and lunges. Second place went to Lila Baba of Helena, Montana. The first thing noticed about the Short class was the abundance of naturally beautiful smiles: were these women enjoying themselves? Seems so! Michele Wile had plenty of reason for enjoyment: she took first place at 29 with five years of training. At 34, second place Trina Durham brought a decade of training to the stage. If a prize had been offered for the person traveling the greatest distance to compete, Elizabeth van Dyke would have taken it: placing third, she calls home Rio de Janeiro, Brazil. Austinite Sharlyn Thames came in fourth, while Shannon Wood rounded things out in fifth place. Doubtless the hardest of the Novice Figure classes for judging, the Medium class was packed with mature muscular development. Lisa Wolf of Round Rock, Texas’ YMCA dominated this and the overall title. At 36 she’s had only five years of training, presaging a bright future with further training and competition. Second through fifth place titles were awarded to Lisa Wolf, Sandy Crosslin, Peggy Pepitone, Lori Pavesi, and Truda Gordon, respectively: as novices, with further work covering lagging weak places, all should move forward in illustrious figure competition careers. Novice Tall competitors were a consistently young group, with 34 year old Claudia Hensley of Houston taking the title. Kerri Smith, whose primary training activity is being the mommy of Peyton and Parker, came in second. Drag racing and car club participant Nicole Spurgeon took third, while Hyde Park Gym’s Deana Knox took fourth with a scant 18 months of training. Fifth place went to the Boston YMCA’s Jennifer Kubista, bringing another placing to this promising 29 year old with only one year of training. Lori Pavesi won the Fit Model Women’s competition. Second went to Drexel Long, third to Dana Stegall, fourth to Jaime Burnham, and fifth to Nicole Kosich. Charles Fuller won this event with Austin Barbisch, Jason Galihadd, and John Dean in respective positions behind him. Brenda Hayosh, 37, of Austin took the short class thanks to eleven years of training. The charming Peggy Pepitone finished first in the novice tall class, with Kristi Frazier and Joy DiPalma rounding out second and third places. Jerry Buentello dominated in the novice short class with Juan Aranjo close behind. Equally promising Texans Shay Price, Andrew Eixman , and Eric Downing wrapped up third, fourth and fifth places, respectively. Jason Galihadd finished first in what proved to be a tightly fought battle for first place. His shredded physique proved dominant. Right behind him was the Russell Jones, and close behind Todd Tanner for third place. James Thomas and Apollo Yiamouyiannis rounded out fourth and fifth places in this exceptional class. Ten years of training brought Matt Grube of Austin first place honors, with Taylor Burford, also of Austin, in second. Extending gratitude to is wife “for putting up with his crazy hobby,” Don Stricklin came in third. Corby Holcomb, fourth, and Tim Bond, fifth, rounded out this class. Great things forbode for contestants in the short men’s open class starting with first place winner Trentonne Taylor! Not far behind was “Sir” Jerry Hill, 44, with 26 years of training earning him self-proclaimed knighthood. Matt Gil of San Antonio took fourth while Barron Stone came in fifth place. All three classes left the audience grateful they were not in the judges’ seats this night. The highly impressive Joshua Brown won both first place and the Overall Open class titles. Very close behind his was the equally impressive Gregory Hall of El Paso. Both third place Wes Carnegie and fourth place Jose Flores are forces to be contended with in the future. At age sixty years young, Reed Masters’s 45 years of training won him first place against men decades his junior. You might say “mature muscle rules” from his victory! Hyde Park Gym’s own Austin Barbisch awesome physique display was punctuated with spontaneous humor that had the audience in stitches. He’s like a Steve Martin turned bodybuilder with an uncanny sense of comedic timing. Mark Anderson, Michael Sheppard, and Tony Noviello brought in respective third, fourth, and fifth places. Lisa Nordstrom, 43, took first in the Open Women’s Short class while Karen Fletcher, 42, took second. Most remarkable is that both awesome ladies share in only four short years of training. We look to great things from both as they continue maturing! Julie Hall, 36 year old Austin firefighter took both the Tall Class and Overall title, her radiant smile expressing the joy of posing. Right behind her was Teri Alvardo, Juli Pelloni, and Ahlisha Newton. Lean and trim, Peggy Pepitone reigned in the Masters Women’s title, astonishing the audience with revelation that her hobbies include cooking, baking, and making sushi. How she manages to eat those foods yet be so shredded is a mystery. Lisa Nordstrom’s outstanding calves and back assisted her second place. Lisa’s posing suit top works against her by hiding her lat development when doing frontal poses, while her unfeigned natural smile brings attention to her. Coming in third was the vivacious Karen Fletcher, and fourth to Ruthi Elliot. Again, a tough class for the judges! The teen men revealed what competition is coming next. First place Joshua Gruwell with 18 months of training at age 18 shows a brilliant future. Both 16 year old Edmond Schoolfield and 19 year old Liam Robinson, New South Wales, Australia, likewise presented admirable physiques despite just a few years training. All three possess arms most of us train for years to get. Taylor Burford was the sole contestant in this class while showing a bright and promising future. Gregory Kerr, 37, stationed in El Paso, Texas possesses a mature physique and great posing skills. We expect to hear more of him in the future. Don Stricklin of La Grange TX won first place at 48 with only three years of training. Second place went to Tony Noviello, third to Jason ”The Hulk” Little, fourth to Michael Allen, and fifth to Damon Smith. Reed Masters, 60, of Odessa ,TX , is living proof of what 45 years of training will do. Words simply fail to describe his condition at an age the general public would regard as “aged” or “elderly.” Behind him was Melvin Ware, 56, opening his posing with a full cape dropped to reveal an amazing display of his awesome physique highlighted with mask and boots. He brought the house down with an act well choreographing musical selection with movement ... or was it dance. Chuck Thompson of Edmonton, Alberta, Canada provided yet another masterful posing display. It was revealed that his competition in the Shredder Classic in recent years resulted in his marriage to local women’s physique winner Marti Boyle of Victoria. 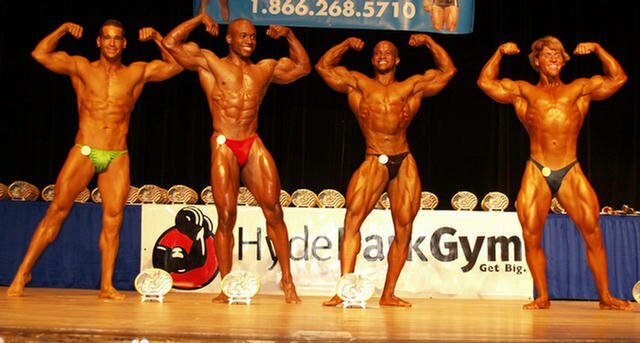 Sam Felts of the Victoria YMCA took forth, thanking his mom and dad for good genetics, while Al “Doc” Yurvati’s inspired posing rounded out the winners with fifth place. The Rookie division was for Masters’ in their first competition. Todd Tanner won the event, with Jason Little, Robert Todd, Sam Felts, and Stephen Schmerbeck taking respective positions second through fifth. It only gets better from here for South Jersey see you in the Spring at our next show. The NPC of NJ salutes the participants - officials, athletes and supporters - and commends the tireless efforts of all involved ensuring a highly successful Show.